Islamic State has released chilling video game-style footage of the assassination of a Yemeni colonel, who was gunned down by masked killers. Airport security Col. Abd Al-Rahim Al-Dale’i was executed by ISIS militants as he climbed into a car in war-torn Aden, a port city in the south of Yemen. Although no group initially claimed responsibility, Islamic State later released the first person footage of the callous attack. The sickening film shows the gunman approaching Mr Al-Dale’i with his weapon raised, as the colonel steps into his car. He then pulls the trigger and the airport security boss is seen lying sprawled on the ground. ISIS militants have taken advantage of 19 months of civil war in Yemen to expand their presence in the city, which has become Yemen’s temporary capital. The country’s embattled government is based in the city and there have been several assassination attempts on leading political figures and soldiers. Colonel Ali Muqbil Awadh, a senior officer in the country’s intelligence services, was shot dead while driving through the Mansoura district of Aden in September. The colonel was gunned down by masked assassins as he made his way to the mosque for Friday prayers. In August Islamic State released similar footage of another shocking gangland-style drive-by shooting in Aden. Pictures showed a fanatic pointing a gun with a silencer attachment out of the window of a car before shooting a man in the back of the head. 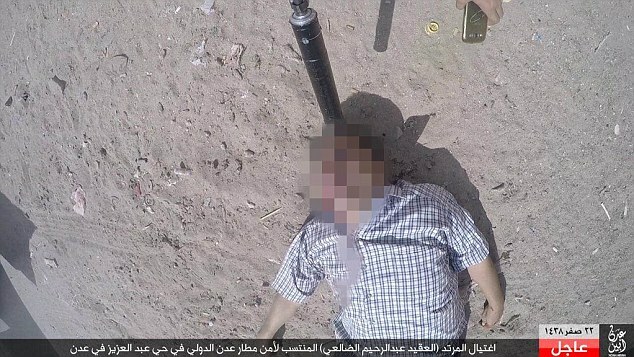 ISIS militants claimed the images show the assassination of another colonel. Yemeni President Hadi’s government fled to Saudi Arabia after rebels overran the previous capital Sanaa and several other major cities – including Aden – two years ago. Saudi Arabia has attempted to drive out the rebels with a series of bombing raids on the country, which began in March 2015. Saudi forces, with the backing of other Arab nations, want to reinstate the previous internationally-recognised government. Arab coalition forces – with the support of local resistance groups – have managed to regain control of Aden, but large parts of the country remain under rebel control. UN figures suggest more than 10,000 people have died since the fighting began, and attempts to resolve the conflict failed in August when two months of UN-sponsored peace talks in Kuwait ended without resolution.